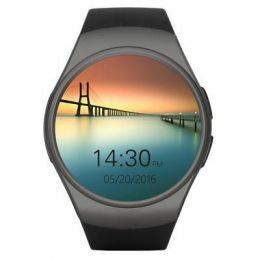 GET 65% OFF THIS MUST-HAVE Smartwatch! LAST PIECES! Limited Time Only Not sold in stores. KM1 Sapphire™ has superior like functions Heart rate monitor, sleep monitor, sleep analysis, pedometer, sedentary alarm, alarm clock, stopwatch, calculator, photograph, dial, reminders, clock, anti-lost, SMS, bluetooth sync, music player & remote camera all in one. SUPPORTS: IOS and Android OS. 1.3 inch HD IPS LCD round screen, 2.5 D radian capacitive touch screen, OGS, 340 mah high power polymer battery, standby approximately 3-4 days, in use less than 1 day. Read messages and notifications on your wrist smart watch (Twitter, Facebook, WhatsApp SNS), phone contacts will be synced to the watch directly. Support Dial Hands Free with Bluetooth connection. APPEARANCE: A comfortable nano watchband, soft, vogue, thin, convenient, practical, anti-perspiration frosted surface and nonhazardous (TPU72 degree).